As most of us watched in awe on 19th May 2018, Meghan Markle walked down the isle of St George's Chapel at Windsor Castle to meet Prince Harry on their wedding day. 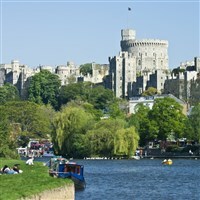 This excursion includes a river trip on a traditional Salters Steamer and entry into Windsor Castle, one of the most amazing Royal residencies still in use. Lunch is included and you'll have free time to explore all the beautiful boutique shops. At the Castle you can view the State Rooms, Queen Marys famous dollshouse, the semi-state rooms and the Grand Reception Room, as well as St Georges Chapel. Dont forget to send us a postcard!